A collection of students, faculty, and staff members from The Baptist College of Florida (BCF) in Graceville left November 9 to represent the college and serve messengers at the annual Florida Baptist State Convention and Pastor’s Conference held November 11-13 at Wayside Baptist Church in Miami, Fla.
Having experienced the unexpected with bouts of stormy weather, sunburns in November, detours in major cities, and two blowouts on the trailer, BCF representatives “Chose Joy” as their theme and represented the Lord, BCF, and Florida Baptists well. 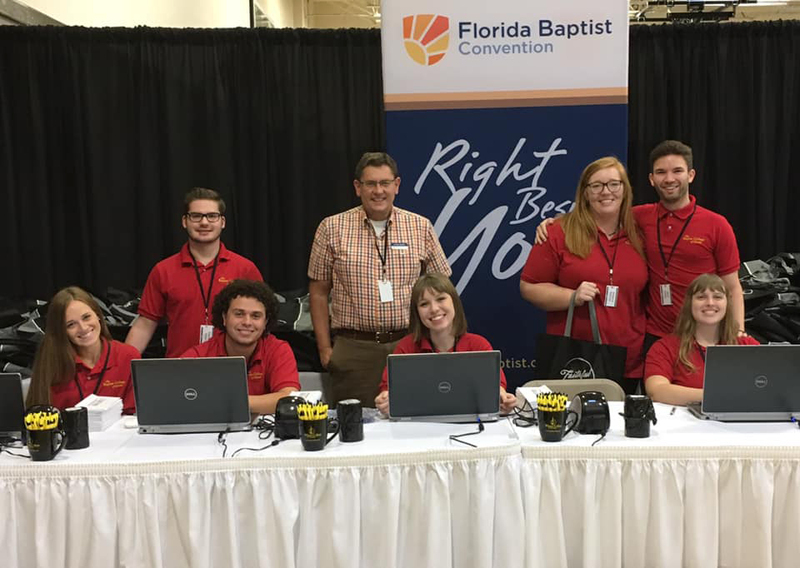 Representatives provided information at the BCF exhibit booth, reconnected with alumni and friends of the college, registered Florida Baptist messengers, parked cars and directed traffic, and supported the BCF College Choir and Orchestra as they led worship during one of the convention sessions. Convention staff, exhibitors, visitors, and messengers attending the convention were all greeted by the helpful and smiling faces of BCF students as they served in the registration area and directing traffic. According to the registration team, they registered more than 1000 individuals, many of which were BCF alumni or familiar faces that had preached in the R. G. Lee Chapel on campus. On Tuesday afternoon, the BCF College Choir and Orchestra led the session with a praise and worship performance under the direction of BCF Music and Worship Division Chair William Davis, followed by the annual video and report to the convention presented by BCF President Thomas A. Kinchen. BCF students that were at the convention were proud and moved by their president as he addressed the messengers, and spoke of the recent devastation in our communities, acknowledging the firm commitment of support, prayer, and thankfulness to Florida Baptists for their assistance. Additional BCF highlights from the convention included the election of several new members to the BCF Board of Trustees and the excitement of seeing so many graduates in leadership positions serving throughout the convention. The convention was an uplifting and exciting time under the leadership of Executive Director-Treasurer Tommy Green offering hope and continued support to the mission of The Baptist College of Florida of changing the world. 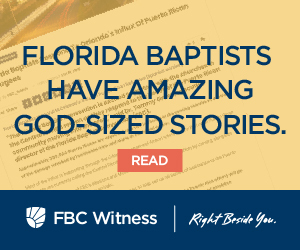 BCF is a proud cooperating ministry of the Florida Baptist State Convention. For more information on The Baptist College of Florida, please call 850-263-3261 ext. 460 or visit the website at www.baptistcollege.edu.